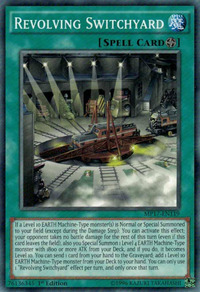 If a Level 10 EARTH Machine-Type monster(s) is Normal or Special Summoned to your field (except during the Damage Step): You can activate this effect; your opponent takes no battle damage for the rest of this turn (even if this card leaves the field), also you Special Summon 1 Level 4 EARTH Machine-Type monster with 1800 or more ATK from your Deck, and if you do, it becomes Level 10. You can send 1 card from your hand to the Graveyard; add 1 Level 10 EARTH Machine-Type monster from your Deck to your hand. You can only use 1 "Revolving Switchyard" effect per turn, and only once that turn. Construction Train Signal Red, Express Train Trolley Olley, Heavy Freight Train Derricrane, Lionhearted Locomotive, Ruffian Railcar and Snow Plow Hustle Rustle appear in this card's artwork.